Top knot buns are amazing hairstyles because they’re very easy to do and they suit any hair length. All you need to do to get one is to pull all of your hair back into a knot and secure it with rubber bands or bobby pins. It is so easy and so customizeable. 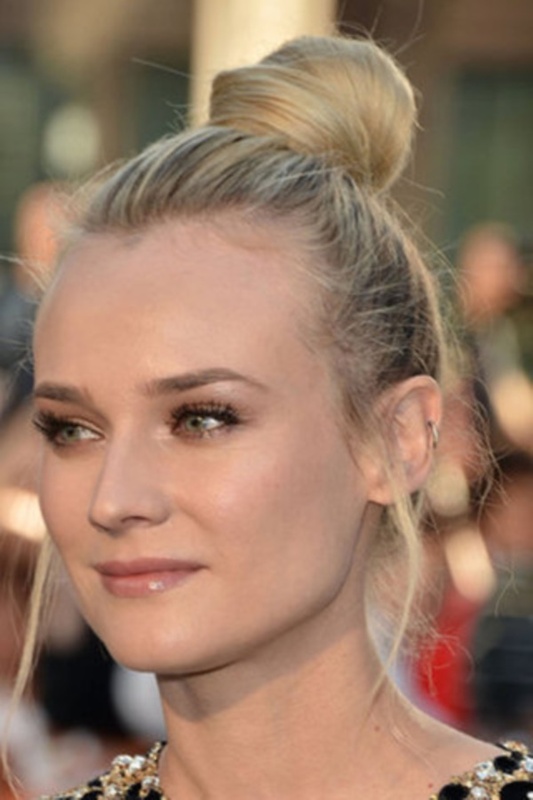 Below are examples of styles that you can draw inspiration from when doing a top knot bun. 1.A top knot bun with loose braids works for blonde hair because it creates dark accents throughout the hairstyle. 2. 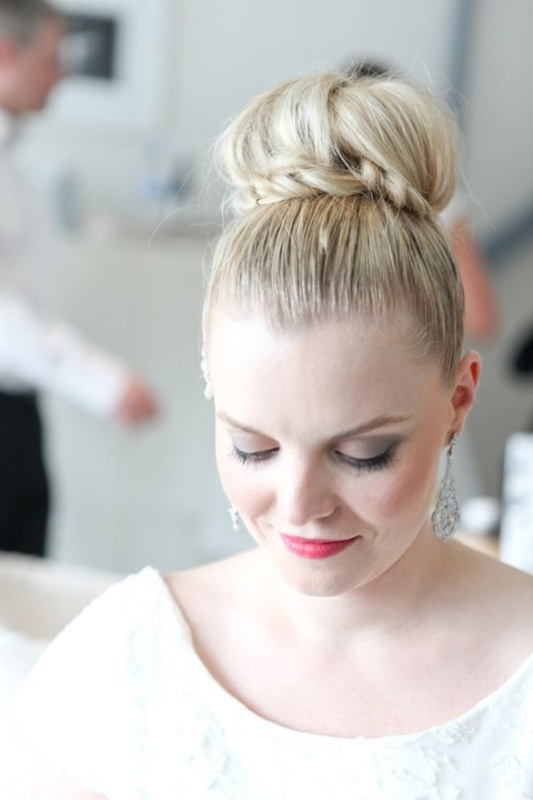 Top knots can also work as a bridal hairstyle. Paired with a plain white dress, this clean look provides an overall vibe of sweetness and elegance. 3. Bella Hadid is seen here sporting a clean top knot. It accentuates her cheekbones and jawline because there are no loose strands of hair to distract the attention from her face. 4. An oversized top bun is also fashionable. This can be achieved by placing “molds” within the hair structure, as well as teasing the strands to provide volume. This is not exactly a practical hairstyle because of its size, but it can definitely work for fun photo shoots. 5. Anne Hathaway here is seen with a bun at the back of her head while her bangs are swept up into a wave-like hairstyle at the front. This style gives the head more dimension because it provides two separate buns. 6. You can also create a messy updo by bundling your hair at the top of your head in a seemingly careless fashion. You may deliberately tease out strands of hair to improve the aura of messiness. Furthermore, you can also let your bangs hang loosely so that it can nicely frame your face and give you a more contoured look. 7. This is a mixture of tiny and large braids, all knotted into a bun. This definitely takes a lot of effort but the resulting texture of your hair makes it worth it. All the tiny braids contribute to providing more dimension to the hairstyle. Additionally, the large braid is a nice finishing touch. 8. Adding a braid along your hairline works well in two ways: it gives an illusion of a headband and it makes sure that all your hair is tucked in neatly. Knotting this braid along with loose hair near your nape is another creative hairstyle. 9. Placing your knot to the side is another fun way to be creative with your bun. 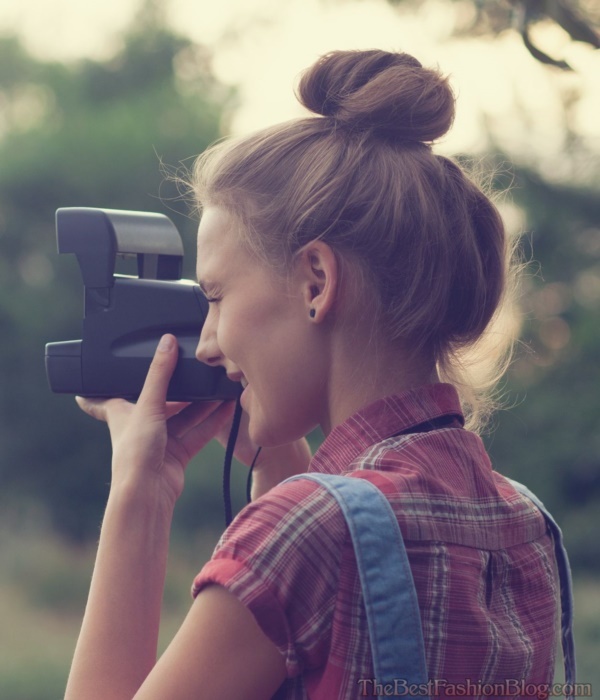 Letting your side bangs run towards the same direction further directs the attention towards your right shoulder, which is seen to be working perfectly in this photo as she is wearing an off-shoulder dress. 10. Here is very sharp and clean top knot that is evidently held in place by bobby pins. If you happen to have bobby pins as well, then you can definitely try this out! 11. This knot is not the tradition knot wherein the hair is just rolled around into a bun. This bun actually made use of a sock or a foam to provide more dimension and volume to the hairstyle. 12. Jennifer Morrison sported a top knot on the red carpet because to knots can be worn even in the most fabulous occasions. 13. You can also upgrade your top bun by adding gems to the area near your nape. 14. You can also step away from the traditional bun by teasing up the bangs. 15. Instead of a traditional round bun, you can upgrade and make the shape into a rectangular! 16. You can further accentuate your voluminous updo by adding strands of jewelry at the side. It instantly provides a more elegant and upscaled vibe. 17. A bun can also be great to show off any nape tattoos you have. 18. Katy Perry is seen here with an ombre hairstyle. Turning it into a top bun gives an illusion that her roots and her bun are of entirely different colors. Her hair dye also matches the gothic and smokey-eye look she is sporting here. 19. As seen previously with Katy Perry, the same concept is applied here. However, the lighter shade of her hair is also partnered with a softer face make up. 20. You can also tilt your very high messy top bun to the side to give off a more casual and informal vibe. 21. Why settle for just a single bun when you can get two adjacent ones? The braid also provides more dimension to avoid the traditional trend of buns. 22. A bejeweled bun can be elevated by letting the tips of the hair run in loose strands downwards. 23. 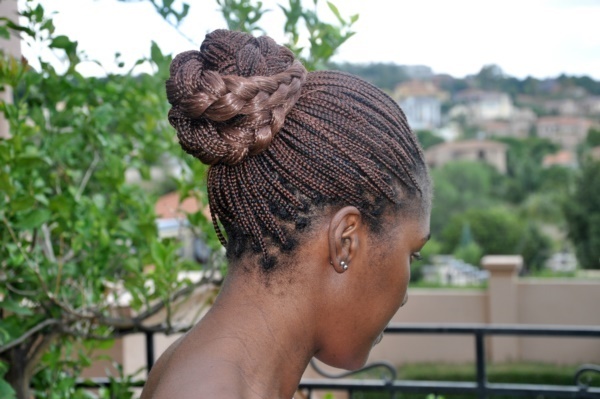 You can also have this style in which the twisted braids are held by bobby pins to create a zigzag pattern. This works well with people who have fair hair because the contrast with the shadows makes the zigzag pattern pop up. 24. You can also create a very voluminous bun by curling your hair into large curls and then loosely assembling them near your nape by braiding them. 25. 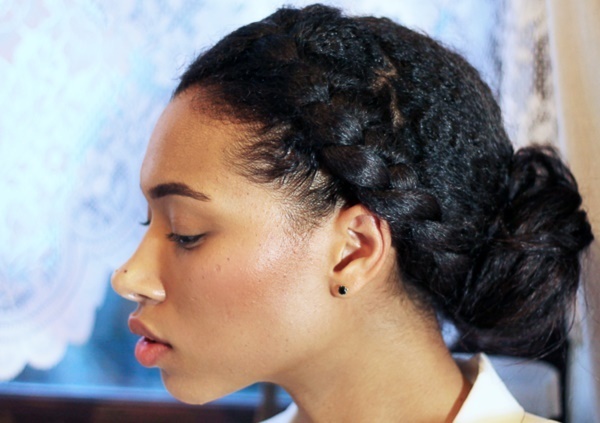 You can also partner your bun with a braid that goes all the way around your head. It keeps the hair neatly in place and it is also a creative way to sport a bun. 26. Piggy buns are also great! In this photo, it is paired with pink hair which gives off the vibe of being young and carefree. 27. 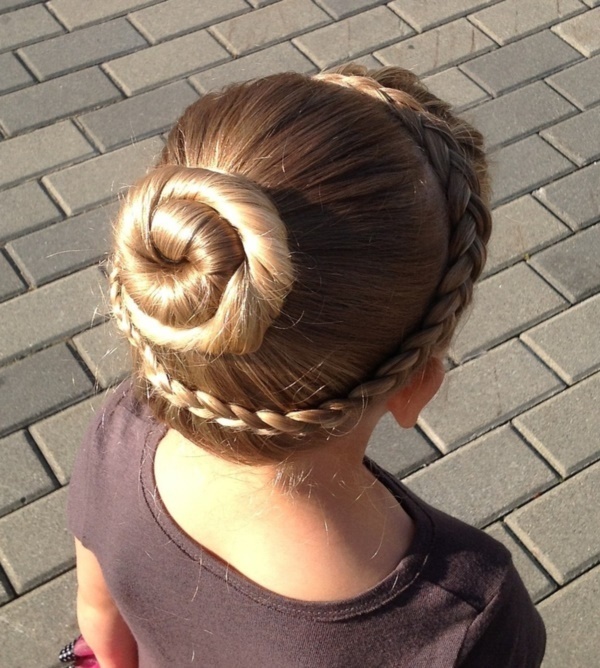 Another dimension you can incorporate into your bun is the circular braids pattern. In this photo, the hair is teased first to create volume. Afterwards, the lower half is braided and molded into the circular pattern using bobby pins. 28. This photo shows that buns can work well with short-haired people, too! The hair can be neatly tucked into a bun situated near the nape. 29. A clean and voluminous bun can be accessorized with bows, as seen in this picture. 30. Here is another photo of Katy Perry with a bun. Her hair is initially neat and cleanly swept into the bun, then the bun is wrapped into a twisted braid. 31. Another great accessory for a bun is a huge white flower. 32. Here is another example of a hairstyle teased into a bun. The special thing about this style is how the ends of the hair is seen to be curled upward and into the bun. 33. 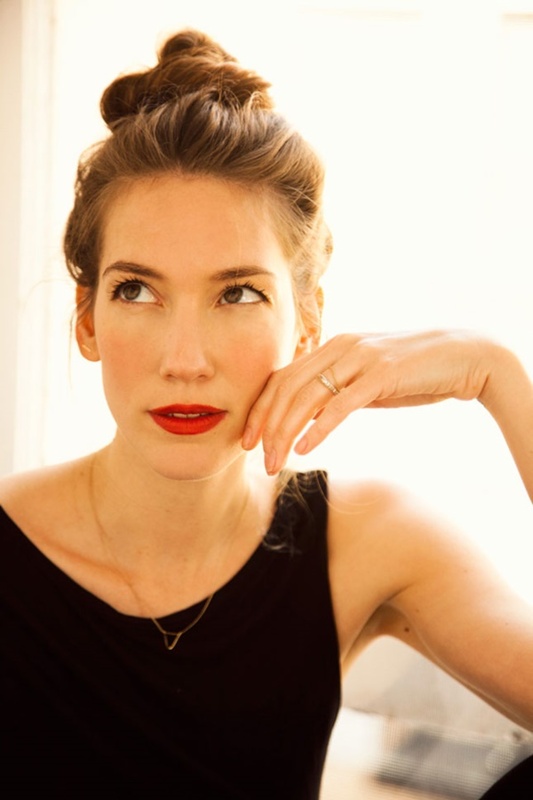 You can also loosely curl your hair into large curls and then sweep everything into a side bun. 34. This hairstyle definitely gives off the vibe that it is derived from the 1920s. 35. 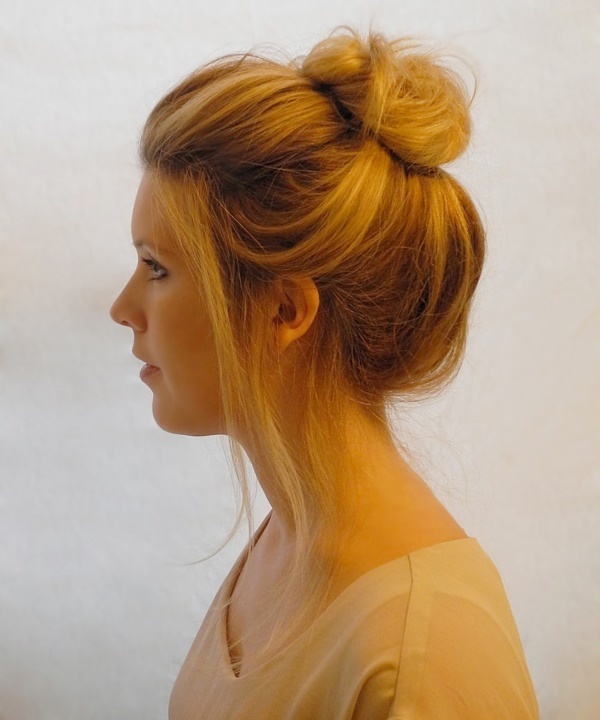 You can also style your top knot bun by first starting off neatly from the roots, then creating a messy bun at the end. These two different styles creates variation into the hairstyle. 36. 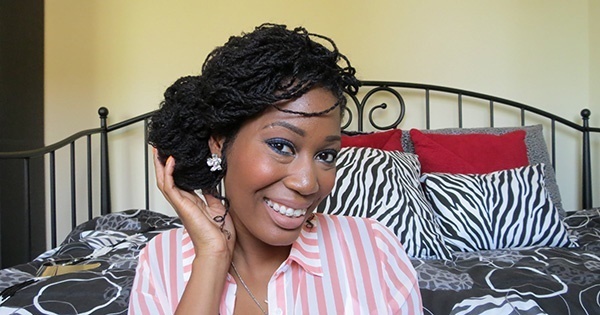 This is another example of a bunch of tiny braids woven into a single side bun. It is fun and creative. 37. You can also let your full bangs loose while sweeping the rest of your hair up into a big bun. Your bangs will nicely frame your face and accentuate your eyes, while the bun provides a clean look. 38. A low and side bun is also great to be paired with a dress with a plunging neckline. 39. You can finish up your updo by hiding the unnecessary strands beneath a broad braid around the bun. This is a technique to maintain the clean look all throughout. Eliminating the loose strands provides you a moore poolished look. 40. If you want to accentuate all the contouring technique you employed into your face make up, you can opt into a tight top bun as illustrated by Kim Kardashian below. 41. 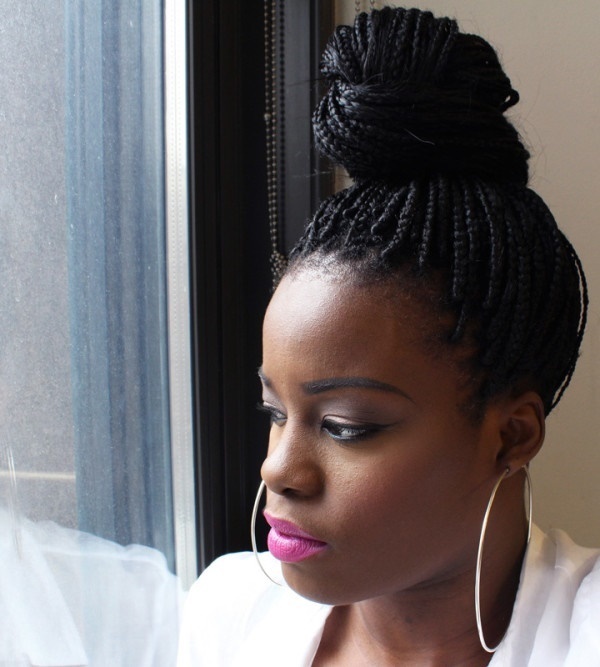 This is a traditional top knot which is a great option to highlight your face. 42. This is another example of a hairstyle in which the front of the hair is teased up while the rest of the hair is knotted into a bun at the back. The variation provides more dimension throughout the hairstyle. 43. You may also draw inspiration from Emily Blunt here in which she had a braid along the middle of her head and fused into the bun at the back. The creative yet simple hairstyle complements her very bright eye make up. 44. If you’re not a fan of showing off the works of your bun, then you may do this style in which the bun itself is hidden withing the hair. The end result provides a very polished and clean look. 45. You may also literally elevate your hairstyle of mini braids by placing everything into a simple knot at the very top of your head. 46. Here is another photo of Katy Perry sporting a bun while letting her fringed full bangs loose. This look is definitely great for hiding a very broad forehead and accentuating your eye make up. 47. You may want to use fishtail braids into your bun. This look appears very textured and detailed. It gives off the impression that a lot of work was put into the making of the bun. 48. This bun is a perfect hairstyle for your daily errands. Loose strands may be placed at the sides of the face to frame your features nicely. 49. Are you having a lazy day? This casual top bun can be paired with any outfit when you’re dressed down. It’s definitely perfect for when you’re running errands and you don’t want any stray hair distracting you from your work. 50. Here’s another classic example of hiding any loose hair bun strands by placing them underneath a broad braid. The braid also doubles as an accessory. 51. When doing a bun, it’s not necessary that every hair is knotted into it. It may be an option to let them hang in loose curls at the back. 52. You can upgrade your bun by making a loose braid around your head that appears to look like a crown. The end result will have you looking elegant, sophisticated, and refined. 53. In this hairstyle, the hair is parted to the side and the rest of the strands are gathered in the back to form a loose and curly bun. 54. Who says you have to tame your curly hair into a bun? You can draw inspiration from this hairstyle in which the hair wasn’t straightened at all. The overall look is still amazing. 55. Angelina Jolie here is seen sporting a clean bun. This simple hairstyle matches the simplicity of her dress. 56. here is another example of making a headband out of the braid and letting it fuse into the bun. The special detail about this style is how the bun is finished off with twisted braids and not with the three-part braid she initially started with. 57. This voluminous bun at the top of her head is perfect for her outfit. Her feathery dress wouldn’t receive as much appreciation and attention if there were loose strands of hair over it. 58. Here is Jennifer Lawrence in a high, top knot bun. It is the perfect hairstyle for her dress because she can show off her backless piece. 59. This illustrates that hair buns are perfect for daily wear. All you need are bobby pins and you’re good to go! 60. A top knot bun also works well with a halter dress. Letting your hair hang loose would cover up your shoulders, and that would not look great considering that your neck and chest area are already fully concealed by the halter design. 61. Letting a few loose strands of hair get teased out of the bun gives it a flossy feel. This style below is perfect for high fashion photoshoots. 62. The hairstyle below gives a very edgy feel because of the straight-cut hair jutting out of her bun. 63. You also have the option to let the hair near your nape balloon out to give your head more volume. 64. Here’s another classic example of a top knot bun. 65. 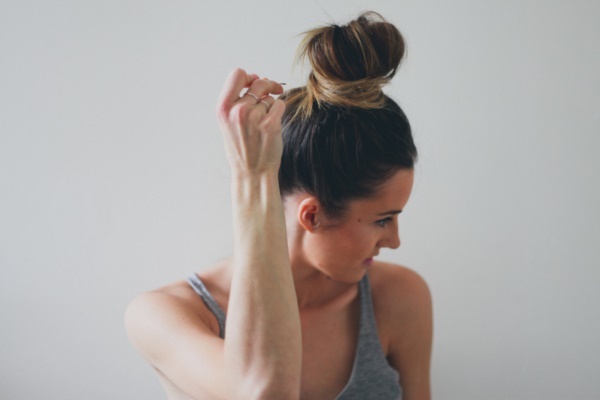 Giving your bun a disheveled look makes it less formal and more casual. 66. Buns also go well with your classic little black dress. 67. A double top knot bun is also great to give you that casual Instagram bae look. Make sure that each bun looks unkempt for it to pass as daily wear. 68. A voluminous top bun can be useful to add more height to petite individuals. 69. You can also put all of your hair up in a high bun if you have any earlobe piercings that you want to show off. 70. Pairing your bun with a classic black dress and a string of pearl necklaces will give you a look that is very reminiscent of Audrey Hepburn – classy and timeless. 71. Instead of the traditional manner of knotting your hair into a bun, you can also try creating a fan-like shape to give your style some variation. 72. Shailene Woodley is seen here sporting a high bun. It is very simple and it aptly shows off her shoulders, hence complementing the tube cut of her dress. 73. Instead of the aforementioned broad braids as headbands, you can play with the size and make it so much smaller, as shown here. 74. And here is another example of using a broad braid to hide the loose strands of your bun. The braid also doubles as an accessory. 75. Who says your hair accessories have to be limited to bejeweled pieces? You can use a string of leaves to give you a natural and earthy vibe. 76. Kendall Jenner here is seen wearing her hair up in a bun which complements the halter style of her dress. Furthermore, she let her bangs loose to accentuate her eyes. What a stunner! 77. Miley Cyrus aptly paired her tube top with a bun. 78. In making a bun, it’s not necessary to put all your hair up. Like in this photo, only half of the hair is knotted into the messy bun. 79. Cara Delevingne also used a top bun as a red carpet hairstyle. 80. Here is Ariana Grande with her hair in a high bun. A high ponytail is actually her signature look, which came as an accident. She keeps her hair in a ponytail to hide the bald spots on her scalp due to hair dye damage. Nowadays, she is known for it. 81. Here is another example of pairing buns with outfits that reveal the shoulders. 82. Putting up your hair in a bun to show off a glamorous accessory like a faux fur scarf is a great idea. 83. Here is Reese Witherspoon sporting a bun. It evidently matches her dress. I hope you can draw inspiration from the list above. The important thing to note is to pick the hairstyle that you’re absolutely comfortable with.